These foams are designed for shock isolation of heavy objects when the supporting foam will be under long-term static stress. The TF-6070 Series offers excellent shock isolation with minimum creep while under continuous static stress loads that range from 0.2 to 10.0 psi. 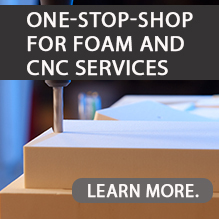 Like other LAST-A-FOAM® TF-series high-density polyether polyurethane foams, the TF-6070 Series is formulated to absorb large amounts of energy while protecting payloads from high stress levels. It is quite firm in relation to its density and features relatively flat static- and dynamic-stress-versus-deflection curves. Except under conditions of intense UV radiation, these polyether-urethane formulations are highly durable and resistant to environmental factors, maintaining consistent performance. Elevated temperatures have no long-term effects up to 180°F, but these foams do lose approximately 10% in firmness at the higher temperature. Reduced temperatures also have negligible effects except at subzero temperatures, when the foam can become significantly firmer. LAST-A-FOAM® TF-6070 products serve applications that do not require flame-retardant foam. General Plastics has supplied large quantities of these flexible foam products for use in the Minuteman program as shock isolation of the missile and instrument floor. They have also been used widely as dunnage for nuclear warhead shipping and storage containers. For a flame-resistant version with similar properties, opt for LAST-A-FOAM® TF-5070 products. Their performance parallels TF-6070 open-cell polyurethane foams, except for the need to use a slightly higher foam density under equal conditions. These products are available as sheets, blocks and molded parts.